Need a Crown? We Can do It Same Day. You probably know if you need a crown. The most obvious example is a chipped, broken, or discolored tooth. Teeth that have an unacceptable appearance due to color or shape can be made to look natural and attractive with crowns. Another is a missing space. That is, the base of a tooth may be fine, but most of what people can see may be missing (the upper portion). A crown can fill in that space. Other situations are harder to see, in the mirror anyway. One is a root canal, which leaves the tooth hollowed out and predisposes the remaining tooth to cracking. That tooth needs a crown immediately to prevent it from fracturing. A tooth with a large filling similarly needs to be covered with a crown for protection. Crowns are available in a variety of materials and may be made of porcelain or ceramic to match the color of natural teeth. While crowns generally take 2-3 weeks to be created at a dental lab, the team at Pure Dental Health offers same-day crowns with CEREC. What is CEREC and Why is it Important? At Pure Dental, we use the latest and most technologically advanced equipment. CEREC stands for Ceramic Reconstruction and is a sophisticated system of designing and making high-quality dental restorations in one patient visit. 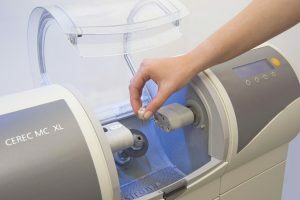 Developed by Sirona, CEREC utilizes 3D photography and CAD/CAM technology to assist a dentist in designing a virtual restoration (onlay, inlay, crown, or bridge) without taking impressions and, when combined with a milling unit, is able to build the actual restoration while you are still in the chair. Sure, it’s cool. But more important, and the one driving our decision to have one, was the value to you. In addition to cutting down on the number of visits and the time interval of waiting to get back from an outside lab, there’s no need for messy impressions, and there’s no need to wear a temporary crown for two weeks (that could possibly crack or break and result in even more office visits!). This all translates to savings of money and time for you. Our doctors have extensive education and experience in crown placement and recovery. We offer the same-day crown service using our in-house CEREC machine. We can take an impression, shape the custom crown for you, and place it. All within one trip *. (404) 382-7801. We are ready to help! While our office has the ability to provide a same-day crown (and most cases are), sometimes a patient’s dental health precludes the ability for a one-day solution. For instance, if the patient’s dental root is not healthy enough, adding a crown will not be the best treatment. Our doctors will advise if that is the case, and if so, then this situation will involve more than one visit.